Son of the Greek-Catholic priest Stefan Gojdic and Anna Gerberyová. Attended elementary school at Cigelka, Bardejov and PreSov, finishing in 1907. Studied theology at PreSov, Slovak Republic and then Budapest where he consecrated himself and his work to the Sacred Heart. Finishing his studies on 27 August 1911, he was ordained soon after. Worked briefly as assistant parish priest with his father. Prefect of the eparchial seminary, and taught religion in a higher secondary school. Supervised protocol and the archives in the diocesan curia. Assistant parish priest in Sabinov. Director of the episcopal office in 1919. In a surprise move, he joined the Order of Saint Basil the Great at Cernecia Hora on 20 July 1922, making his vows on 27 January 1923, and taking the name Pavol. Apostolic administrator of PreSov on 14 September 1926; during his installation he said, "With the help of God I want to be a father to orphans, a support for the poor and consoler to the afflicted." His first official act was a pastoral letter on the 1100th anniversary of the birth of Saint Cyril, apostle to his Pavol's people. Bishop on 7 March 1927; his episcopal motto: God is love, let us love Him! Promoted the spiritual life of the clergy and laity. Founded new parishes, and insured proper and valid liturgical celebrations. Built orphanages, founded the Greek-Catholic school in PreSov in 1936, and supported the publications Messenger of the Gospel and Thy Kingdom Come. Great devotion to the Real Presence and the Sacred Heart. Apostolic administrator at Mukacevo in Slovakia on 13 April 1939. Due to difficulties between Pavol and the local government, he tendered his resignation from the position. The Pope refused to accept it, and instead ordained him residential bishop of PreSov on 8 August 1940. On 15 January 1946 he was confirmed in his jurisdiction over the Greek-Catholics in the whole of Czecho-Slovakia. The Church in the region received a serious blow with the seizure of power by the Communists in 1948, and their immediate fight against the Greek-Catholic Church. Bishop Gojdic refused to submit the Greek-Catholics to Russian Orthodoxy, or dismantle the Church in accord with Communist ideology. The government isolated him from the clergy and the faithful, and simultaneously tried to bribe him with offers of support and power if he would break from Rome. "I will not deny my faith," he said. "Do not even come to me." On 28 April 1950, the Communists outlawed the Greek-Catholic Church. Bishop Pavol was imprisoned, and in a show-trial in January 1951, convicted of treason. Sentenced to life without parole and stripped of civil rights, he was moved from prison to prison, constantly abused; in response he prayed in silence, and celebrating the liturgy in secret. In the amnesty of 1953, his sentence was commuted to 25 years in prison, which in practical terms was a life sentence. At one point he was advised that he could straight from prison to PreSov, on condition that he become patriarch of the Orthodox church in Czecho-Slovakia; bishop Pavol explained that this would be a sin against God, a betrayal of the Holy Father, of his conscience and of the persecuted faithful. His sentence continued, the abuse continued, and his health finally broke; he spent his remaining months in the prison hospital, and died there. Bishop Pavol was legally rehabilitated on 27 September 1990, and has posthumously received the Order of T. G. Masaryk - II class, and with the Cross of Pribina - 1st class, one of the great honours of his native land. • buried in the prison cemetery with a marker reading only "681"
The only son of a wealthy Christian Roman senator. The young man wanted to devote himself to God, but his parents arranged a marriage for him. On his wedding day his fiancee agreed to release him and let him follow his vocation. He fled his parent's home disguised as a beggar, and lived near a church in Syria. A vision of Our Lady at the church pointed him out as exceptionally holy, calling him the "Man of God". This drew attention to him, which caused him to return to Rome, Italy where he would not be known. He came as a beggar to his own home. His parents did not recognize him, but were kind to all the poor, and let him stay there. Alexis lived for seventeen years in a corner under the stairs, praying, and teaching catechism to small children. At his death an unseen voice was heard to proclaim him 'The Man of God', and afterwards his family found a note on his body which told them who he was and how he had lived his life of penance from the day of his wedding until then, for the love of God. May have been related to Saint John Gualbert. Young priest probably ordained in the region of Florence, Italy. He seems to have had a failure at clerical discipline; his biographer wrote that Benigno “fell into sin”. To re-examine his life and call to vocation, he made a pilgrimage to the graves of the apostles in Rome, Italy, after which, to reform his life, he joined the Benedictine Vallombrosans, c.1180. As a monk he became a model of penance, piety and humility. To concentrate on his penance, he lived as a hermit in a cell near the Vallombrosa monastery. Abbot of the San Salvi monastery outside Florence, Italy c.1190. Abbot of the Vallombrosa monastery and General of the Order in late 1201 or early 1202; he served for over 30 years and ruled during the period of the Order‘s greatest prosperity and expansion. He worked to maintain discipline to the Vallumbrosan Rule, and bring peace to Orders and houses in conflict of the claim of anti-pope Callistus III. Abbot Benigno enshrined the relics of Saint John Gualbert on 10 October 1210, built the new church in Vallombrosa, a project that took six years to complete, added more cells to the monastery for those desiring to live as hermits, and built an oratorium. In his final years, some time in 1234, Benigno gave up his leadership position, and retired to live in a hermit‘s cell, doing daily penance for the errors of his youth. May have been of noble or royal birth. Monk. While on a pilgrimage to the Holy Lands, Colman was stopped by the Viennese on suspicion of being a Moravian spy; there was continual fighting between Austria, Moravia and Bohemia, and a stranger who spoke no German was immediately suspect. With no evidence other than being a stranger, he was convicted of espionage, tortured, and hanged with two thieves. In the tradition of the time, the bodies were left to rot as a warning to others. Colman's body hung there for 18 months, incorrupt, and untouched by animals. Miracles were reported at the site, including the scaffolding taking root and putting out branches. In 1015, bishop Megingard transferred Colman's relics to Melk, Austria where they were entombed in an abbey on the Danube. The tomb became a site of miracles, and four popes have granted indulgences to those who call on his intercession. There is an annual blessing of horses and cattle held at Melk and near Füssen, Germany on his feast. Youngest daughter of King Louis I of Hungary. Because she was great-niece to King Casimir III of Poland, she became Queen of Poland in 1382 upon her father's death. She was engaged to William, Duke of Austria, whom she loved, but broke off the relationship in order to marry Jagiello, non-Christian Prince of Lithuania, at age 13 for political reasons. She offered her misery in this marriage to Christ, and she eventually converted her husband; Jagiello was later known as King Landislaus II of Poland after the unification of the kingdoms, a union that lasted over 400 years. Noted for her charity to all, but especially the sick and poor, and for a revision of the laws to help the poor. Student of Saint Cyril and Saint Methodius in Moravia and Panonia. Building on their work, he helped found Slavic literature and culture in Macedonia. He was the first Slavic writer, translated dozens of works, wrote a biography of Saints Cyril and Methodius, and founded the first Slavic university in Ohrid. Friend of Saint Naum. Served in the Bulgarian court. Taught from 886 to 893 at Kutmicevica, being a great influence on over 3,000 students, many of whom became priests and spread the Slavic liturgy through the region. Spiritual teacher of Saint Constantine the Presbyter. Bishop of Belica, the first organized Slav Church on the Balkan Peninsula. Bishop of Ohrid. Founded Saint Pantaleimonth's monastery. Born to the Gallo-Roman nobility. Well educated in the sciences and rhetoric. Married to a wealthy member of the nobility. Recovering from a serious illness, Ennodius examined his life, decided to put away worldly things, and consecrated himself to God. His wife retired to a convent to become a nun, and Ennodius became a deacon, serving under Saint Epiphanius of Pavia. Taught rhetoric in Milan, Italy. Bishop of Pavia, Italy in 510 where he was known for his concern for the life of his flock in this world, and for their spiritual training. 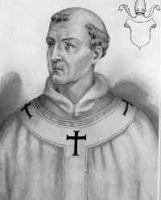 Twice served as legate for Pope Hormisdas to Emperor Anastasius in whose court he worked against the heresy of Eutychianism; on his second trip, in 517, he was so ill-treated for supporting orthodox Christianity that he had to escape the city. Some of his poetry, hymns and ascetical writings have survived. Missionary hermit in the area of Olawa, Silesia (in modern Poland). Monk in Tropie, Poland. Hermit and then Benedictine monk on Mount Zobar, Hungary c.1003 where, at the request of King Saint Stephen of Hungary, he helped establish a hermitage. Spiritual teacher of Saint Benedict of Szakalka. Known for his austere, contemplative life and personal piety. A biography of him was written by Blessed Maurus of Pecs. Mentioned in the Canterbury Tales's Nun's Priest's Tale. Venerable John Henry Newman made frequent pilgrimages to the shrine of Saint Kenelm's martyrdom. For many years the villagers of Kenelstowe, England celebrated Saint Kenelm's Day with the ancient custom of "crabbing the parson" - bombarding the parson with crab apples! Daughter of the Roman imperial prefect of Gaul. 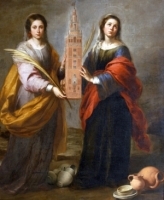 Elder sister of Saint Ambrose of Milan and Saint Satyrus. She moved to Rome, Italy when very young, and was raised by her older brothers. A consecrated virgin (like a modern nun), receiving the veil from Pope Liberius on Christmas Day 353 in Saint Peter's Basilica. Never cloistered, she lived with her mother, and in other private homes. Worked with Ambrose in Milan after his consecration as bishop. Noted for such austerities that her brother encourged her to relax in her later years. Ambrose dedicated his treatise on holy virginity to her. Cardinal-priest. 103rd pope. He saw the Saracens attack Rome, Italy in 846; upon his ascension, to prevent its recurrence he fortified the city and its suburbs, building a wall around the Vatican, fortifying the part of Rome still called the Leonine City. Rebuilt Saint Peter's Basilica. Rebuked Saint Ignatius of Constantinople for deposing bishops without his knowledge. Crowned Louis II joint Holy Roman Emperor with Lothair I in 850. Crowned Alfred as king of England in 853. A pair of sisters, the daughters of a potter who became potters themselves. A wealthy customer offered to purchase a large part of their earthenware for a very good price, but when the girls learned that the pots would be used in pagan rituals, they smashed them all. They were imprisoned and executed for heresy against the gods. Martyr. Layman in the apostolic vicariate of Southeastern Zhili, China. During the Boxer Rebellion, he was ordered by the Mandarin to renounce Christianity; he refused. Martyr. Spiritual student of Saint Foillan of Fosses. Missionary monk and then abbot at Kerkelodor Abbey near Antwerp, Belgium. Nephew of Saint Nerses Glaietsi. Bishop. Archbishop of Tarsus. Helped reunify Armenia with the Church of Rome in 1198. Translated many important Church documents into Armenian including the Rule of Saint Benedict, and Saint Gregory's Dialogues. Mercedarian lay brother at the convent of the Holy Spirit in Lima, Peru. Miracle worker known to heal the sick by singing the Magnificat. Born to the nobility of Constantinople. Martyred in the iconoclast persecutions of Emperor Leo the Isaurian. Mercedarian deacon at the Incarnation convent in Valdonquillo, Spain. Cistercian monk at Himmerod monastery in Trier, Germany. Renowned for his personal piety. Christian who cut down a tree dedicated to a pagan god. Martyr. Bishop of Auxerre, France c.507 to 516. Attended the Council of Orleans in 511. Priest. Missionary. Worked with Saint Foillan of Fosses in the Netherlands and near Antwerp, Belgium. 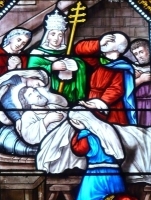 Several churches are dedicated to this saint in Wales, but no details about him have survived. One of the Seven Apostles of Bulgaria. Eleven Discalced Carmelite nuns, three lay sisters and two lay women servants who were martyred together in the French Revolution. They were the earliest martyrs of the French Revolution that have been recognized.